The Checks follow up 2009's Alice by the Moon with a new album - Deadly Summer Sway - and a change in sonic direction. UTR caught up with Jacob Moore to discuss writing the album and how their perspective has changed through the experiences of the band over the years. Hey Jacob, what have you been up to? I've actually been running around picking up supplies for tomorrow morning, we’re leaving for Wellington. Are you heading out on tour? Well the best way to do it in NZ is to do Thurs/Fri/Sat nights and then return to Auckland because it costs heaps of money to stay in hotels all the time. 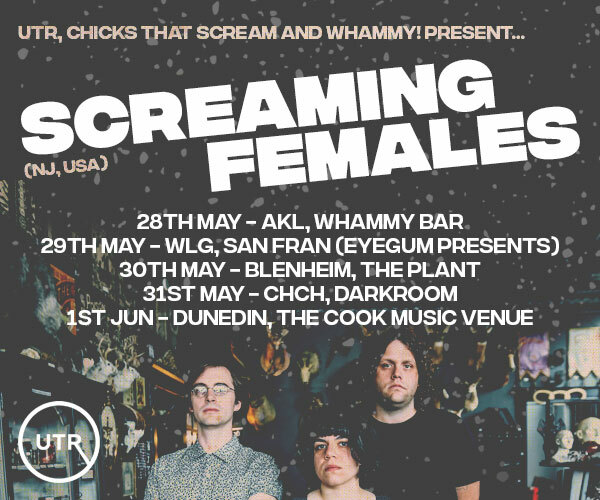 So we are gonna go down to Wellington and play an acoustic session at the Radioactive which basically means we’re going to play reggae versions of the songs. Then we’ve got an all ages show and then our proper show. It’s gonna be a big day tomorrow. That’s why I need supplies. Tell us a little bit about writing and recording the album. We seriously started considering doing a record early in the year. It took a while before things came into focus but we really started knuckling down around April. So the writing process involved writing up on a whiteboard all the potential songs that anyone had written since the last record and there was about 50 songs on the board. We went through and crossed off the ones that definitely weren’t gonna be on there. Then we started to learn the songs and give some of these ideas a chance before we ultimately went ‘nah’. Writing was great, we all got together and we played a lot quieter in practice than we had in the past because we wanted to hear a little bit more detail as opposed to smashing it out which has always been our philosophy. We thought we’d try to be a bit more thoughtful about what we’d done. When we got into the recording studio the songs were ready to go. It was a really fun process and working with Bob Brockman was a treat; he’s a super interesting guy and he has this infectious energy about him as a lot of Americans do. It seems like it’s a change in direction? Did you go in knowing you wanted to do something different? It’s not that we ever want to do something different or maybe it’s that we always want to do something different. We don’t have conscious control over that, it’s merely when the songs come about there's a new thing that we like. I think that all of our records still follow a similar thing: the songs are all song-y, they’re pop songs. They follow a basic structure, always have a hooky melody or guitar line. We’ve always been about having infectious grooves and infectious hooks and that is still evident on the new record. I think the ideas are more realised than on Alice by the Moon though. Alice by the Moon was knocked out pretty quickly. We were experimenting, we’d just come back from England under major label rule and we were kind of keen to do whatever we felt like doing and let every word and every sound come out on that record without going ‘nah’ too much. This one was more keeping within the trance. Bob’s main mantra over the recording was 'don’t disturb the trance'. If we’re jamming and everyone is on the main feel of the song it’s really obvious if someone comes in and disturbs it you know it can be a very subtle thing. Is there any thematic countenance or particular inspiration that you guys used for this album? I guess we didn’t try to base it on anything. We’ve always liked bands and the classic band sound so we’ve been listening to a lot of Stone Roses over the last record. I really like how open and melodic their music is and it’s really joyous. And then I think there’s more us being interested in different styles in music; we’re not too prejudiced about what’s trendy or what’s in fashion or what’s too pop and should be deemed unacceptable by the cool people. We’re pretty open and we appreciate music if it feels like it comes from a good place, and if it’s quality we like it. So I guess that comes out. It’s still a reasonably varied record so it doesn’t have one really common strand going through. Before Alice by the Moon you spent a lot of time in the UK and gained a lot of attention. How did that experience affect you guys as a band? It is really surreal but obviously a whole lot of fun. After having that and then not having that it teaches you a good lesson about what to expect from a life in music and it re-affirms the reasons why we make music which is really just to have fun and give other people enjoyment if they want to accept our music. So it’s made your approach to the industry more realistic? More realistic for sure. We were a really good example of what a hyped up band is. Super hyped up to the point where everyone is like ‘oh my god, that fucken band’, and people still think that way about us! I read a review of 'Candyman Shimmer' on The Corner that said we’d gone all Primal Scream and I was like what? How can you 'go' all Primal Scream anyway? They’re instantly talking about us from five years ago but I guess when you’re around a long time that happens. It was just because we were so young and we didn’t know what we wanted and were chasing the carrot that was being held out. It was a really good time; I look at it as the most massive free OE I could have had. You learn a lot of lessons and on the plus side you play with these massive bands and you learn about what it is to ride on that level; production quality etc., and you notice good and bad things about what it is that they do. What are the plans going into 2012? We have to get the NZ tour and release done and then we can start thinking about what will happen. As a musician you’re subject to what reaction you get to your music. We plan to do an Australian tour and we’re just going to see what people thing about our music and the videos. I’m really happy with the videos that are coming out; the first one is already out. Our friend Ian Hart is an amazing director with a super eye for detail and a really artistic brain. He’s doing all the videos for us and I think the combination of the music and the visual is going to be our best chance for delivering some art of real quality that people will be interested in.